The Dons take on Rangers for the second time in nine days as they conclude their Scottish Cup Quarter-Final with a replay at Ibrox on Tuesday night. The first tie saw the usual close affair between the sides with Aberdeen taking an early lead through Sam Cosgrove’s penalty kick, but Rangers hit back after the break when Joe Worrall scored at the back post from a corner. Both sides had chances to win, but they’ll go again with the winner heading to Hampden to take on Celtic in the Semi-Final. The Dons go into this one on the back of an excellent display at Celtic Park and they left with a point and a clean sheet in a goalless draw against the champions. Rangers played out a 1-1 draw with Hibernian at Easter Road, but the league takes a break for another mouth-watering clash between the Ibrox side and Aberdeen. 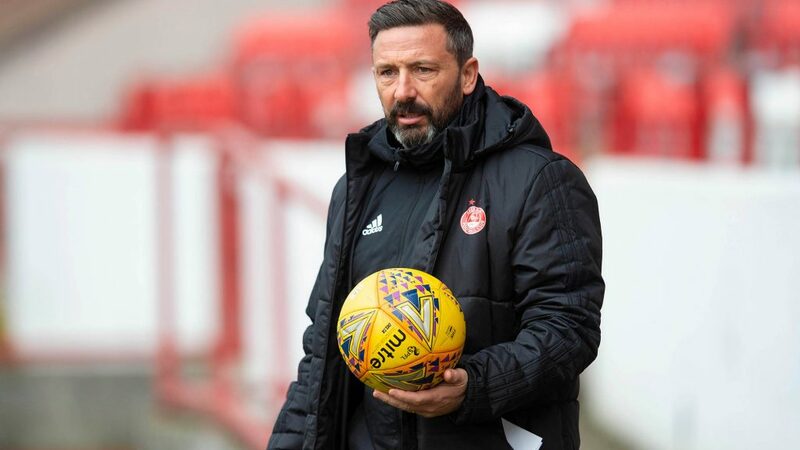 Derek McInnes and Joe Lewis spoke with the media at Clyde’s Broadwood Stadium as the team prepared for the Quarter-Final replay. “Whether we’d won, lost or drawn the game it wouldn’t have really counted too much as each game’s separate. I think in terms of individually a lot of players played very well in the game, we defended really well and we’ll need to defend really well again tomorrow night. We expect Rangers to have a lot of the ball and we just want to make sure we have enough of the ball ourselves and go try be better in that final third to cause Rangers problems. Derek McInnes will be without the services of top scorer Sam Cosgrove as the striker is ruled out due to suspension. The manager did however confirm that Niall McGinn and Gary Mackay-Steven have a chance to return to the squad after injury. Both missed the match with Celtic on Saturday but were given every opportunity by the manager to make the replay at Ibrox. 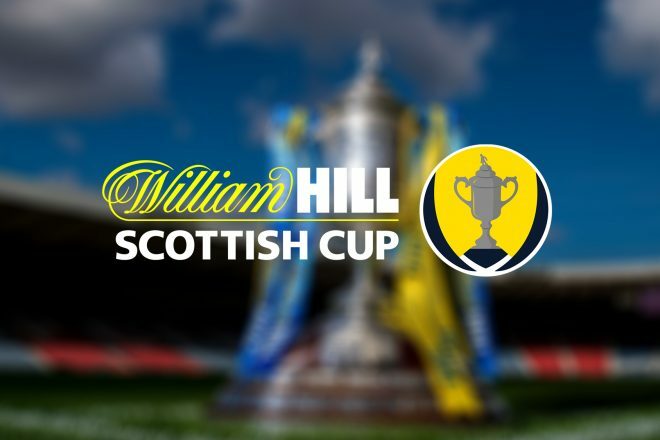 This will be the second replay of this season’s Scottish Cup campaign for The Dons after they were held in the Fourth Round by Stenhousemuir, but overcame their lower league opponents in the replay at Ochilview 4-1. 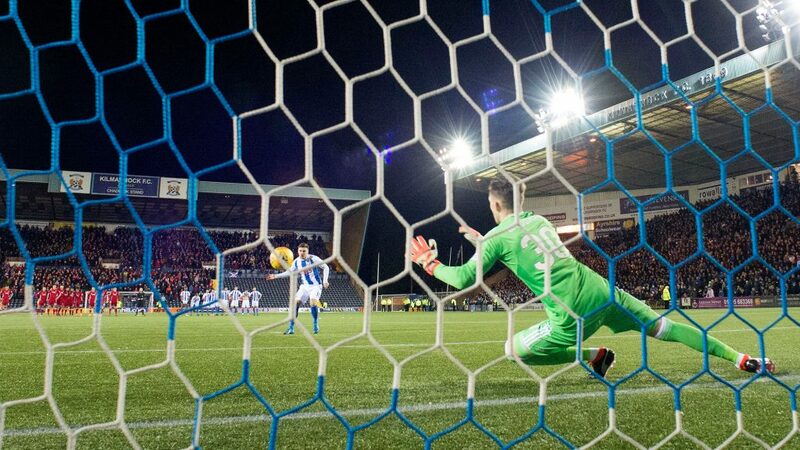 At the same stage last season, The Dons and Kilmarnock went all the way to penalties at Rugby Park and Freddie Woodman saved three spot kicks to send Aberdeen back to Hampden for another Semi-Final. Below we take a look back at recent cup ties that have sent The Dons through at the second attempt. After a goalless draw at Pittodrie, The Dons faced a replay against Dundee at Dens Park. A dramatic night in front of the TV cameras would unfold and Aberdeen took an early lead through Chris Clark’s excellent run and finish after only four minutes. They were pegged back by Steven Robb before ten minutes were on the clock. A nervy match unfolded, but The Dons looked to have won it when Markus Heikkinen fired home his first Aberdeen goal. The tie was all but won when David Zdrilic made it 3-1 just before injury, although there were a few nerves jangling when Nacho Novo pegged one back, but The Dons held on for the win. 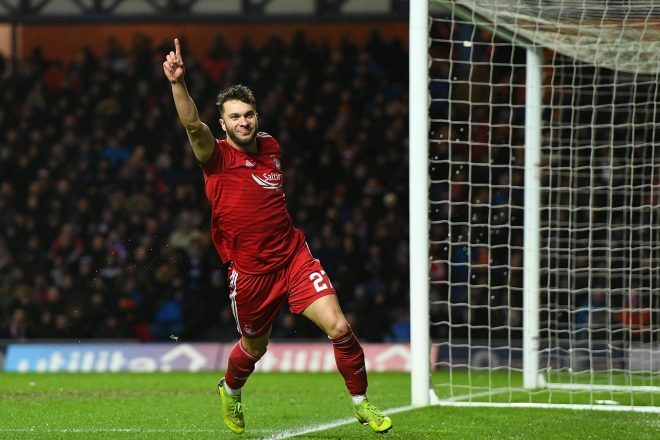 The Dons looked to have missed their chance to reach that season Scottish Cup Semi-Finals after conceding a last minute stoppage time equaliser to Celtic at Pittodrie despite scoring a late goal of their own. The odds were firmly stacked against Jimmy Calderwood’s men, but they defended for their lives in the replay and took the one chance that was required. Once again it was Darren Mackie coming up with a big goal for the men in red as he slammed home from close range with 20 minutes to go sending the travelling Red Army into a frenzy. For the second season in a row Craig Brown knocked his former side Motherwell out of the Scottish Cup at Fir Park. A 90th minute equaliser from Niall McGinn saved The Dons from an early exit before Christmas and a healthy crowd came down for the replay at Fir Park. On the night The Dons were excellent and Rory Fallon, who had made a habit of scoring big Scottish Cup goals gave The Dons the lead after the break. Joe Shaughnessy popped up at the back post to make it two ten minutes later. Despite a late goal from Michael Higdon it proved to be a consolation as The Dons edged through in another tight cup tie. If you can’t make the match you can follow our RedTV coverage with live audio from Ibrox. Due to the UEFA blackout which prevents top-level competition matches being broadcast on nights when Champions League games are taking place, we are unable to show tomorrow’s match live on RedTV International. Post-match we will have a full replay from 10am Wednesday on RedTV International. Match action from 10pm Wednesday in GB & Ireland. Thank you for the support and enjoy the match. Come on you reds! Aberdeen made three changes to the side that drew with Celtic on Saturday. Dean Campbell, who played so well in the second half at Celtic Park, got a start, as did Stevie May who came on late on in that game. James Wilson and Greg Stewart dropped to the bench while Sam Cosgrove was suspended for the replay and Gary Mackay-Steven failed a fitness test. Niall McGinn did make it and went into the starting XI. Greg Stewart had a slight hip problem, but it was hoped that he would contribute something later in the game. It has been raining heavily all afternoon in Glasgow and conditions were not ideal come kick-off with the wind swirling around. All the meetings between the sides this season had been very close affairs and you felt tonight would be the same. Aberdeen got off to an incredible start. Stevie May forced Rangers deep after chasing a long ball from Ferguson. The Rangers throw-in was headed infield by Ball. There was no danger when Glen Kamera picked it up, but his lose square pass was pounced on by Niall McGinn. With his first touch of the game, he controlled the ball and with his second, he dispatched an early shot past Allan McGregor. It was a really bad mistake by the Rangers midfielder but a great finish from Niall. It was the 450th goal scored under the management team of Derek McInnes and Tony Docherty. The first was also scored by Niall on April 27th 2013 in a 1-0 win over Kilmarnock. It really was the perfect start as it also silenced the Ibrox crowd. The home side looked shell shocked. It had been a very positive start from Aberdeen who were pressing well but there was an opening for Rangers on ten minutes and Dean Campbell did well to block an Arfield shot after Candeias had found him with a neat pass. A few minutes after that, McKenna made a good block on Kent and Considine then made an excellent double block after Morelos looked like he was away to score. On 21 minutes, Arfield sent in a cross which was headed wide by Morelos. The Dons defence had shown very good discipline in the opening 20 minutes. On 22 minutes, Considine was judged to have fouled Morelos when the Rangers man was backing into him. The free-kick was in a dangerous position but Lewis made an easy save. After that, the Dons continued to frustrate Rangers who were not able to get any tempo into their play despite enjoying a lot of possession. The frustration was shown by Candeias just before the half hour mark when he received a yellow card for his protests after a free-kick was given by Kevin Clancy. It had been a very good opening 30 minutes. On 31 minutes, Rangers beat the offside trap with a quick counter-attack but Candeias failed to find Kent at the back post with the cross – a let off for the Dons. A minute later, Morelos went down in the area but instead of giving a penalty the referee correctly dished out a yellow card for diving once again. Morelos was involved in the thick of the action a short time after when he went to ground and this time McKenna was booked. There looked very little contact and Morelos was the one who could have been receiving another card. On 35 minutes, Barisic hit a decent free-kick from distance but Lewis kept his calm and made the save. Two minutes later, Rangers forced the first corner from which Ryan Jack had a shot which hit off the post before McLennan hacked the ball clear. At the other end, Stevie May almost broke clear but in the end was booked for a late tackle on Goldson. On the stroke of half-time, Morelos again threw himself to the ground after the slightest of touches from Lewis Ferguson. Ferguson was booked for his protests. Rangers had a free-kick on the edge of the area but Tavernier could only blast the ball into the wall and it deflected behind for a second corner which the Dons cleared. At half time, there were no changes for either side. Aberdeen had defended extremely well in the first half but they would have been keen to do more with the ball when in possession. On 49 minutes, Dom Ball won Aberdeen their first corner. Niall McGinn put over a decent cross which Ball almost got onto the end of, but the defence were able to clear. Four minutes later, McGinn was booked for a challenge on McGregor, catching the keeper as he tried to clear. The Rangers number one did his best to make sure the Aberdeen man went in the book which was disappointing. Rangers then enjoyed some more possession when Arfield managed to keep the ball in play. Jack had a shot blocked as again the Dons defence did their job. There was another penalty appeal when Morelos went down inside the area yet again, but the referee correctly waved play on. On 57 minutes, Scott McKenna produced a brilliant block to deny Tavernier as he turned and hit a shot hit from close range. It was outstanding from McKenna but poor from the Rangers captain who had a man spare beside him. Every one of the Aberdeen players applauded McKenna for his tackle. A few minutes after that, Arfield put over a dangerous cross which Morelos headed wide. Again Considine did very well to put off the Rangers striker. On 61 minutes, Lewis Ferguson won the ball and played it to Stevie May. The Aberdeen striker did brilliantly on the right and slipped in McLennan who composed himself before producing an outstanding finish to slot the ball past McGregor. Four minutes later, Rangers produced a good move which resulted in Tavernier having a shot which Lewis held well. On 65 minutes, Rangers made a double change with Defoe and Lafferty coming on for Arfield and Candeias. At this point, Stevie May did well to head a corner clear at the near post. On 67 minutes Shinnie was booked for a challenge on Kent and then two minutes later, Ball was also booked. It means the skipper will again miss leading Aberdeen out at Hampden in the Scottish Cup semi-final due to suspension. On 70 minutes, Aberdeen almost grabbed a third. Stevie May managed to pick up a Shinnie pass and got to the by-line. There were red jerseys streaming into the area but Rangers managed to get the ball behind for a corner. 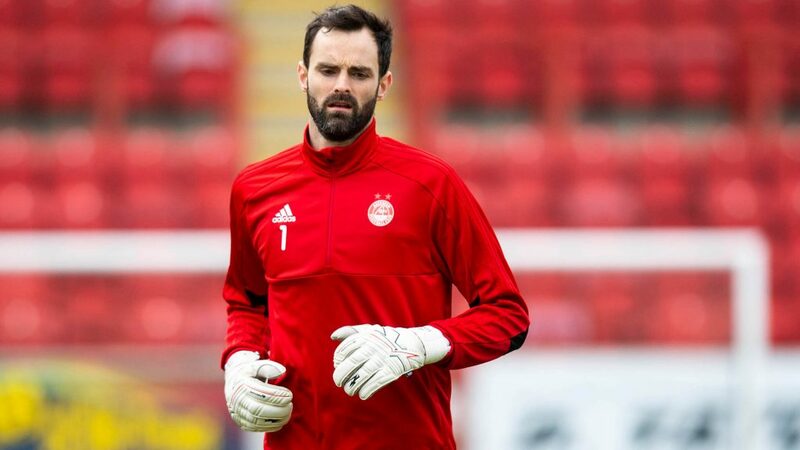 71 minutes in, Aberdeen made their first change as Michael Devlin came on for Niall McGinn, then shortly after, Lafferty glanced a header well over the bar. There was more great defending by the Dons with 15 minutes to go. Defoe was slipped in on goal but Considine produced another superb block. Then two minutes later, McKenna did the same. The two Dons central defenders put in a remarkable performance. Dean Campbell was the latest Aberdeen player to be booked in the 78th minute. The young 17 year old, who produced another superb performance, was replaced a minute later by Stephen Gleeson. On 81 minutes, Considine was booked as Morelos went down to ground again. In total eight Aberdeen players were booked, many of them harshly. But it is the Shinnie booking which is most costly. A minute later, Aberdeen replaced May with James Wilson. Stevie had put in an incredible shift and produced a piece of real quality for the second goal. Aberdeen were doing their best to stop Rangers get any momentum going. On 83 minutes, Lewis beat away a Defoe shot and then Joe produced a great save to deny Morelos. Once again though the Rangers player started rolling about on the ground, holding his face, after an accidental clash with Considine. With two minutes to go, Defoe had the ball in the net after Lafferty flicked on, but the Englishman was well offside. 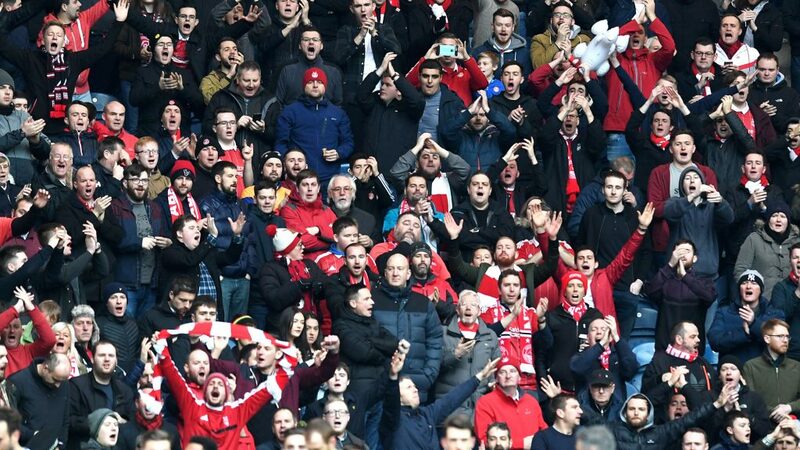 By the time the final whistle went, most of the stadium was empty apart from the 970 Aberdeen fans who were enjoying another special moment in Glasgow.